In 1983, a community committee, many of whom were physicians from First Central Presbyterian Church, recognized a critical unmet need in the Abilene area – affordable healthcare for a segment of the population they described as the working poor. Although employed, many individuals in this group were simply financially unable to afford health insurance, were too young for Medicare, and generally ineligible for Medicaid. As a result of the absence of health insurance, their access to medical care was limited and medical care delayed. With passion and courage, the community committee stepped forward in faith to change their community and improve the lives of their neighbors. What began as a part time clinic operated from the trunk of a car, is now a growing medical mission providing care, compassion, and hope for thousands of patients each year. Since its inception over 30 years ago, the Mission has provided quality health care to over 40,000 people in a 19-county region who had fallen through the cracks. The Mission’s approach to patient care is unique over traditional charitable care which generally offers little patient/physician continuity. At the Mission patients are encouraged to establish a medical home for their primary care and develop a provider relationship with their physician, improving both care and patient confidence. “Access to care” is a phrase that we use often. It is a common phrase in the world of charitable clinics, and it refers to the efforts that we— the Board, Staff, Volunteers, and Medical Care Mission Friends like you — make to ensure that those who need health care receive it, regardless of their economic circumstances. By providing access to care to an often forgotten population, our clinic eases the burden of our local trauma department. We are a 501(c)(3) private, independent, non profit corporation, and rely on public support, private donations and grants for funding. 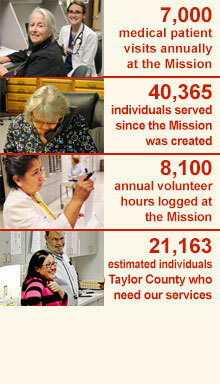 Our volunteers, donors, and community partners are essential to the continuation and success of our Mission.